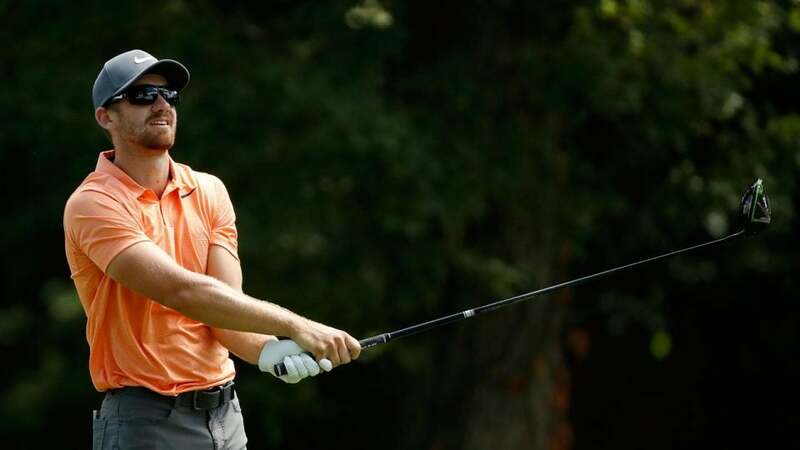 SILVIS, Ill. (AP) — Patrick Rodgers shot a 7-under 64 on Friday to take a two-shot lead after the second round of the John Deere Classic. Rodgers had eight birdies and a bogey to finish at 13-under 129 at TPC Deere Run. Finishing on the front nine, he had five birdies in a seven-hole stretch before closing with a bogey on the par-4 ninth. "It was nice to keep making birdies and keep the gas pedal down," Rodgers said. "It was tricky with some breeze, but I know 13 under is not going to win the golf tournament. So, I got to keep that same mindset for the next two rounds." Bryson DeChambeau was second after a 65. Local favorite Zach Johnson, the 2012 winner, had a 67 to join Charles Howell III, the co-leader after the first round, at 10 under. Howell followed his opening 63 with a 69. Kevin Tway (63), Chesson Hadley (64), Chad Campbell (68) and J.J. Henry (64) were 9 under. Tway had nine birdies in a 10-hole stretch en route to the best round of the day. Hadley is coming off a victory Sunday in the Web.com Tour event in New York. Rodgers, the 25-year-old former Stanford star who is winless on the PGA Tour, has followed the formula that many players have used to win at TPC Deere Run — converting makeable birdies and largely avoiding mistakes. Rodgers also made his fair share of tough shots, notably chipping in from 50 feet on the par-3 third hole and holing a 50-foot birdie putt on the seventh hole. "I put together a really nice round. Was very much in control. Rolled in some nice putts and stayed very patient," Rodgers said. DeChambeau, who was just above the FedEx Cup playoff cut line entering the weekend, survived a pair of early bogeys to grab second place. Tway was struggling to stay above the cut line when he went on his birdie binge, making seven in a row at one point. But Tway's tee shot on his 17th hole found the rough and he was forced to settle for a bogey. Tway's round, the best of his career, was highlighted by a 28-foot birdie putt on the forgiving third hole. "I was kind of hoping it would never stop," Tway said. "You've got to make a lot of birdies around here." Hadley said after his bogey-free round that he felt like he was playing with "house money" after wrapping up a PGA Tour for next season card last week. "I've been heading in the right direction for a while, and I think it kind of starts with your attitude, how you think about and handle things," Hadley said. "So I kind of finally got that right, and then everything came together last week obviously." First-round co-leader Ollie Schniederjans had a 74 to drop eight shots behind Rodgers. Two-time Masters champion Bubba Watson shot a 70 to make the cut at 3 under, as did Davis Love III (68). Three-time tournament winner Steve Stricker (67) made the cut on the number at 2 under. Defending champion Ryan Moore shot a 71 and missed the cut, finishing at 3 over after two rounds. Moore missed the previous five weeks with a left shoulder injury.